Measure your Project Statistics with our Editor Extension: ustats. 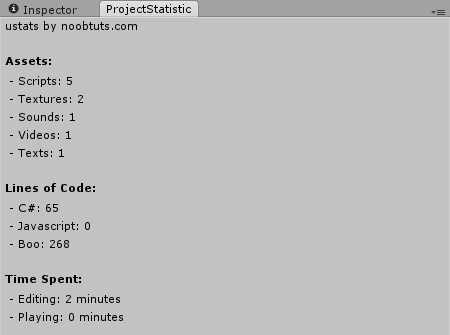 The "Time Spent" statistics only increase while actually working in Unity. They won't increase while the window is inactive or minimized. Note: in order to respect Unity's Asset Store agreement, ustats is not part of the noobtuts Premium files right now.